I am a big fan of aubergines and I can eat them everyday if I get the chance. I like cooking with the small baby aubergines, they usually work well with Indian Inspired recipes. The large dutch variety I tend to use more for continental recipes. 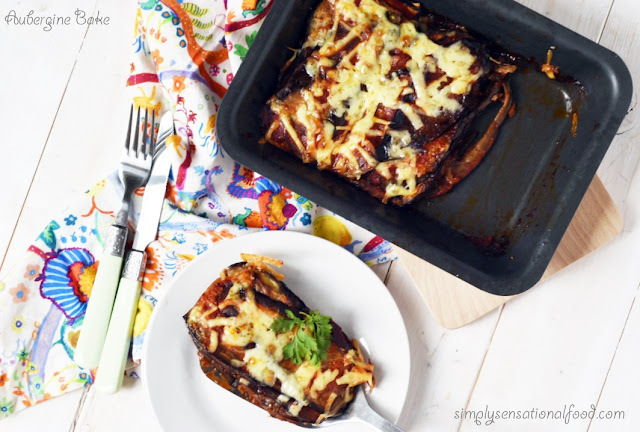 This aubergine bake is a delicious keto friendly (lowcarb) recipe that can be made in advance and is delicious served with a green salad. 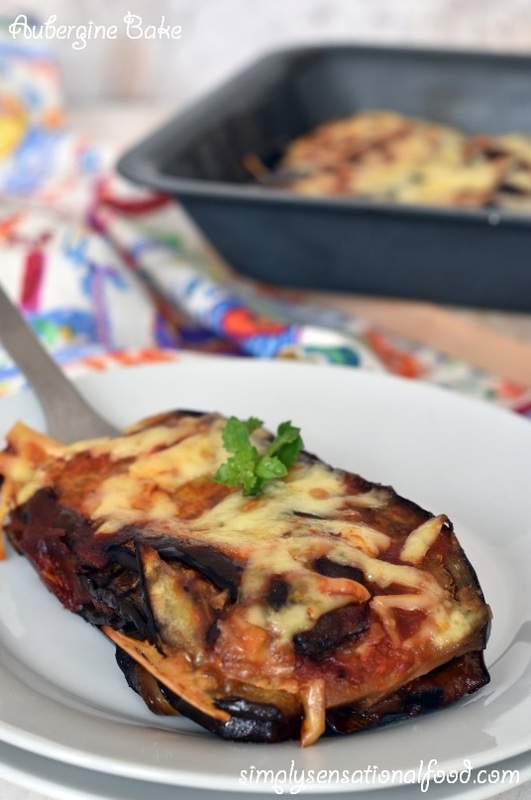 Thin slices of aubergines grilled and layered with Napolitana sauce and finished with grated cheese and baked in the oven. 2 tablespoons olive oil or use the light fry olive oil spray. 1. Slice the aubergines longways very thinly 3 mm-5mm thick, and put them in a bowl with cold water and salt and leave to soak for few minutes. 2. Spray a deep baking tray with oil and keep aside. 4. In a saucepan, add 1 tablespoon olive oil and add the garlic and onions and saute until onions are translucent. 5. Add the passata, salt, chilli flakes, pepper and Italian serves and simmer the passata for 15 minutes on a medium head. 7. Drain the aubergines and pat them dry with a tea towel. Spray the aubergines slices with spray oil 3 at a time and cook them on the griddle for a couple of minutes on each side till the brown lines appear and aubergine slices start to cook a little. 8. Take them out of the pan and repeat process for all slices. 9. 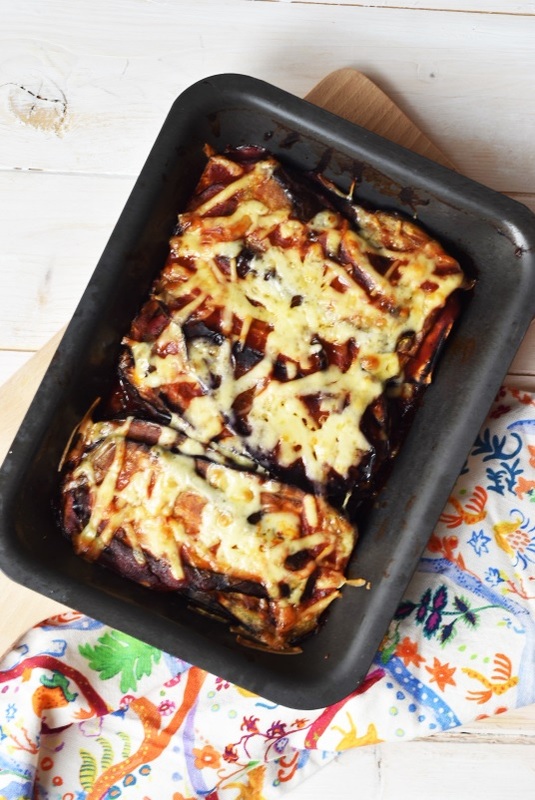 Add a layer of slices on the baking dish fand spread some Napolitana sauce on it, build the layers with the aubergine slices and the sauce. 10. Once all the aubergine slices are layered, sprinkle with the cheddar cheese. 11. 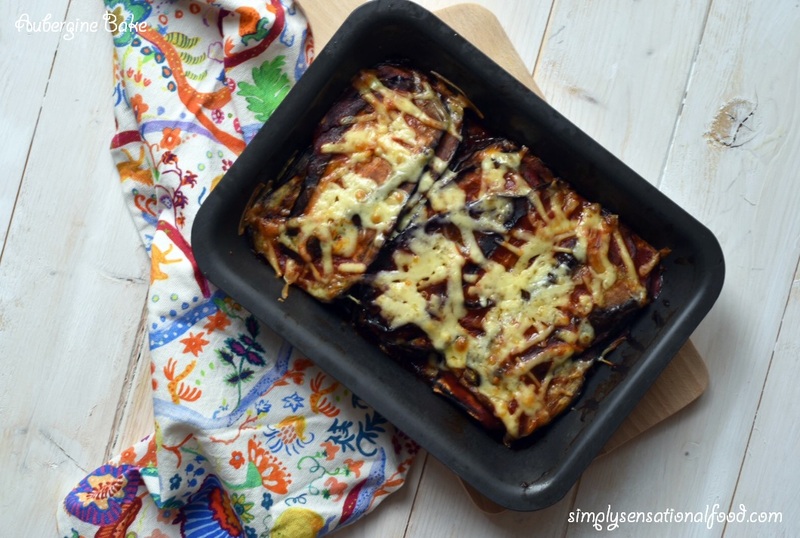 Bake the aubergine bake for 30 minutes in the oven. Remove from the oven when cheese is browned and bubbling. NB- You can add more or less cheese according to your taste. To make it vegan use vegan cheese. This bake can be make in advance and frozen and baked in the oven on the day. 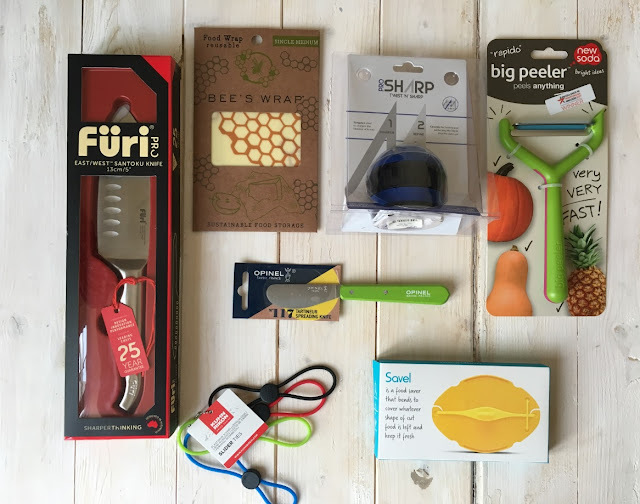 Since the last couple of posts you can see that I have been sharing some really lovely product samples that I received to test in the simplyfood kitchens. 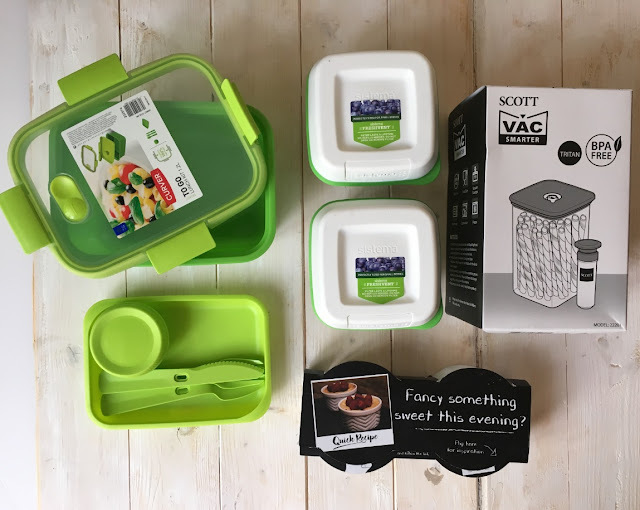 I am really enjoying testing them all out in my kitchen and this is part three in the homeware tidbits section. The Furi Pro 13cm (5 inch) East/West™ Santoku- This knife has a deep blade for larger cutting tasks, a sturdy handle for extra leverage and scallops naturally positioned on the blade reduce friction and make cutting fast and easy. The knife is available on line and in most good kitchenware shops. Single Medium sustainable Bee's Wrap® food storage, they are perfect to wrap bread, cheese, vegetables, or cover a bowl with them. They are a natural alternative to plastic wrap for food storage and will mould to any shape. They can be washed in cool water with a mild dish soap and air dried and then can be reused. The new Pro Sharp Twist ‘n’ Sharp is a 2-in-1 knifesharpener has a very simple single-handed pull-through operation which allows you to sharpen old and blunt knives, serrated blades and scissors. big peeler™ is a really useful large peeler that is perfect for peeling all types of vegetables and fruits. It’s great for tougher skinned vegetables. It is a good rubber grip handle and is food and dishwasher safe. 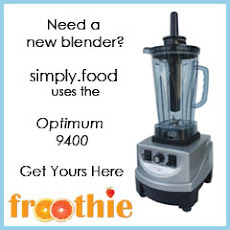 It makes the perfect accompaniment to any kitchen preparation tools. The 6cm Opinel spreading knife. It is made from stainless steel with a beech handle, it has a spatula shape blade that is perfect for spreading butter, spreads, chocolate. These colourful ties by Kuhn Rikon slider ties are made of long-lasting and durable silicone .The ties are fully adjustable and they are perfect for tying bags, bunches of herbs or even cords and wires around the house. They have a simple slider that makes adjusting them easy. Savel is a food saver that bends to cover whatever shape of cut food is left and covers the cut side to keep it fresh from longer. Do you have any favorite products that you have discovered recently?? **I was sent these items to test in the simplyfood kitchens.I was not asked to feature them or write a positive review of them. 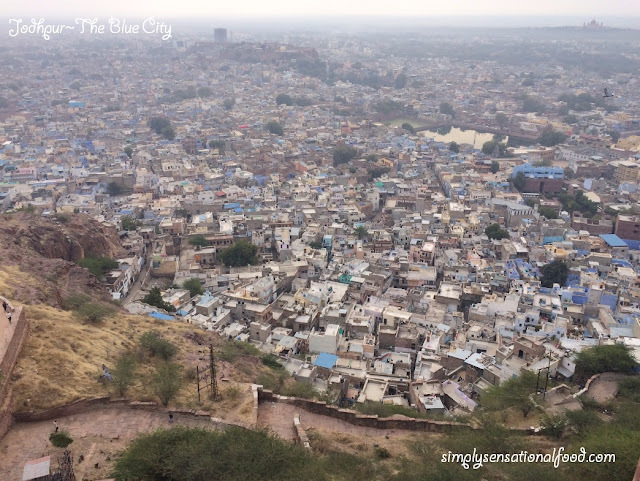 The last couple of months I have had the opportunity to discover lots of new products, I featured afew in a previous post and today I am going to share some more that I am trialing at the simplyfood kitchens. Barista and Co Brew It Stick Coffee Infuser-The perfect present for someone who just loves real coffee but doesn’t always have the time to get out the cafetière or filter jug. This is a simple device which makes one cup of coffee straight in the mug. It retails at £11.99 and is available from most homeware stores or on line. Melitta Original coffee filters have specially arranged aroma pores ensuring that your filter coffee develops its flavour perfectly. Available on line and in most home ware store. If You Care Snack and Sandwich Bags – If You Care Sandwich Bags are grease proof un coated, they are not treated with petroleum-based paraffin wax, soy or any other type of wax. The bags are also suitable for use in the microwave. SMART To Go by Curver is composed of a wide range of handy boxes and accessories for your lunchtime needs. The range is divided with snack boxes, lunch boxes with cutlery, full lunch kits with sauce cups and separation trays and some accessories (cutlery sets, cup sets, etc). Sistema Fresh vent storage containers are perfect to store fruits and vegetables. They help to keep the produce fresher longer with its built-in FreshVent™ lid filter. They are available in assorted sizes too. The Vac Smarter food container is ideal to store different food items. It has a vacuum seal which is created to seal in freshness of food to lock in freshness, flavours and nutrition. Set of two ramekin dishes by quick recipe, these are perfect to create those scrumptious desserts and souffles in the oven. I love organising my kitchen and some of these products have been really useful to have. Are there any new products you have recently discovered, that you love? 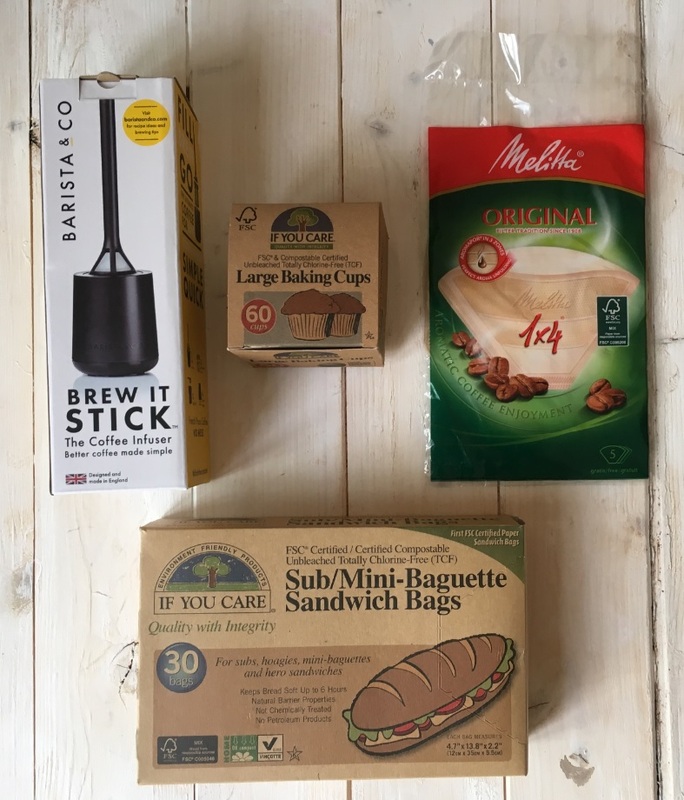 ** I received these products to test in the simplyfood kitchens, I was not asked to write a positive review all opinions are my own. The last couple of months I have been invited to many press events and it’s always a great way to discover new products that are on the market. In this round up I am sharing some of the lovely product samples I have received to try in the simplyfood kitchens. 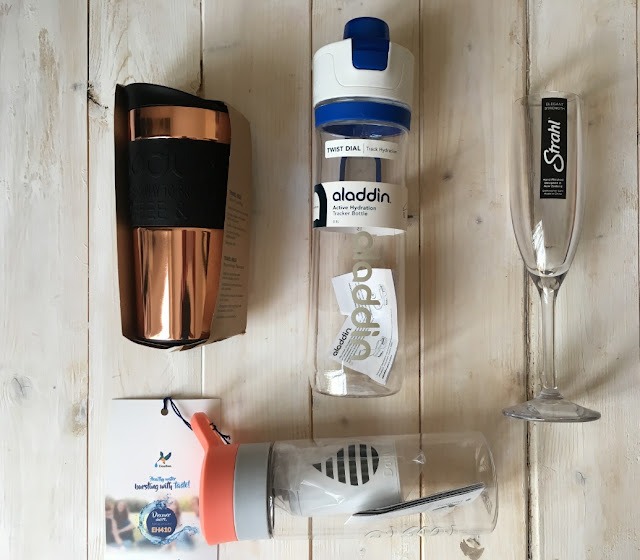 Aladdin Active Hydration Tracker Bottle, this is the perfect bottle to fill and take with you to ensure you stay hydrated throughout the day. It retails at £14.99 and it is available from most home ware shops and on line. OXO good grips dish squeegeeis a handy gadget to clear left over food off dishes with a simple swipe. It will be available on line from November in the UK so do watch out for it as its a great little helper in the kitchen. Addis Dish Brush, made with firm bristles and a bamboo handle, this is really handy in the kitchen to clean off food leftovers stuck to plate. 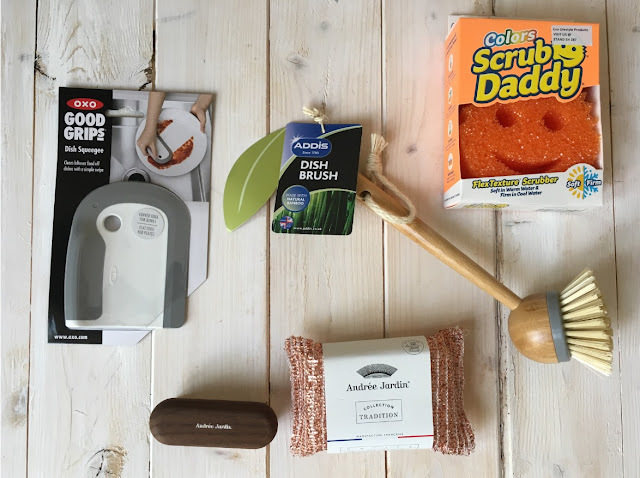 Colours Scrub Daddy, this smiley scourer is perfect for cleaning all your dishes. It is odour free and does not scratch your dishes. These Andre Jardin nail brush anD scourer are great to have in your sink tidy to wash the pans and clean your nails with. Do you have any favorite products you have recently tried that you would highly recommend?? 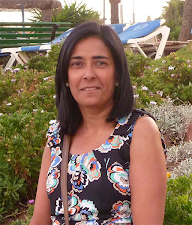 **I would like to thank all the brands who have sent me these lovely products to test, I was not asked to write any positive reviews in exchange for these products. 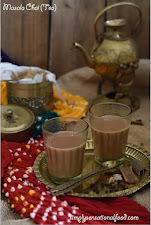 One of my favorite cuisines is Indo Chinese, I am not even sure if this is a made up term or it actually exists but basically it means that the dish has a fusion of Indian/Chinese flavours. My two most popular Indo Chinese recipes on my blog are Chilli Paneer and Chilli Mago (cassava) They are super delicious and and family love them. Taking inspiration from these recipes I have come up with another family favorite, Sesame Chilli potatoes. The key to this recipe is to use baby potatoes. 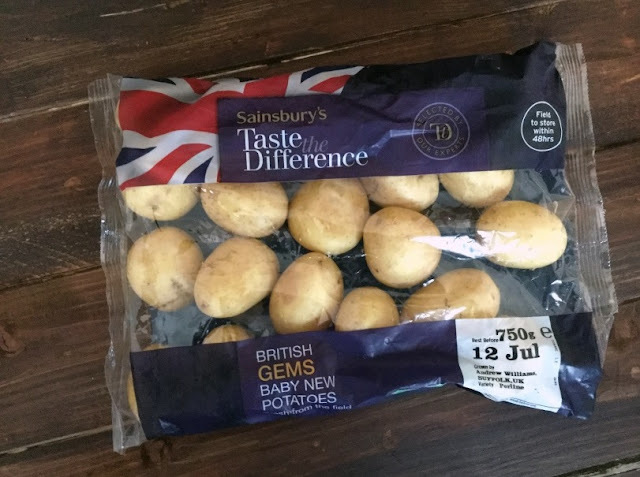 I love using the Taste the difference British Gem Baby New Potatoes that are currently in season and are available in Sainsburys. The distinctive buttery flavour of these new potatoes, give this dish a lovely taste as they absorb the flavours beautifully. I always prefer to cook them with the skin on. 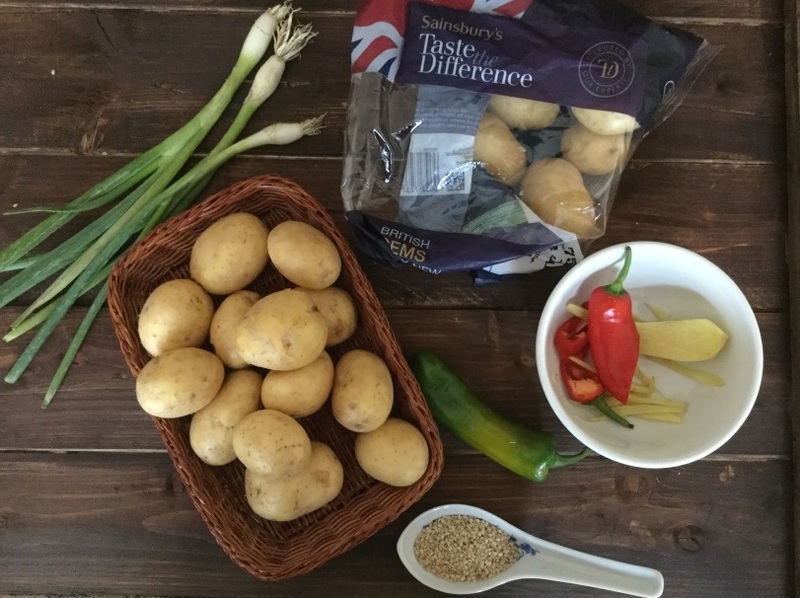 Did you know that the British Gem new potatoes are British grown, collected daily, washed and packaged and they are available in the supermarket within 48 hours of being harvested. You can't get fresher potatoes than these, unless of course you grow your own!!! 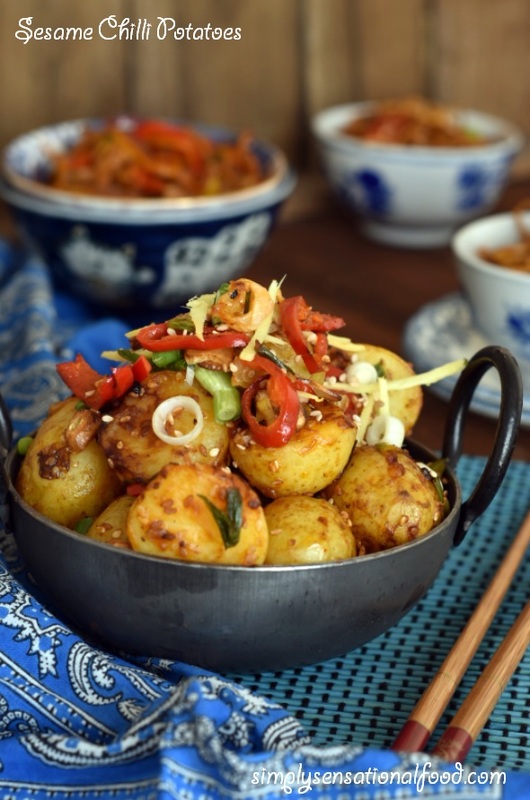 New potatoes tossed in a sesame chilli sauce with Indo -Chinese flavours of ginger, garlic, chilli and soya sauce. 1. Wash and prick the potatoes and put them in a large pan with 1 litre of water and 1 teaspoon salt. Boil the potatoes until cooked. This will take approx 15-20 minutes. 2. Drain the potatoes and pat them dry with tea towel. 3. In a large wok add the oil and when its hot, saute the garlic slices and remove them once they turn golden brown and crispy. 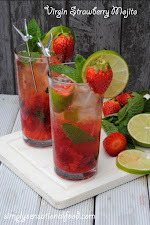 Keep aside for garnishing later. 4. In the same oil, add the potatoes and saute them until brown and crispy. About 5 minutes. 5. Add three quarters of the spring onions (reserve the remainder for garnish), red / green chilli and sesame seeds to the potatoes and saute for a further 3 minutes. 6. Add the soya sauce, sweet chilli sauce, salt and toss the potatoes for another 2 minutes. 7. Transfer the potatoes to a serving dish and garnish with the ginger juliennes and sauteed garlic and the remainder of the spring onions. NB- If the potatoes are a large cut them in half as this recipe works best with small potatoes and also leave the skin on. 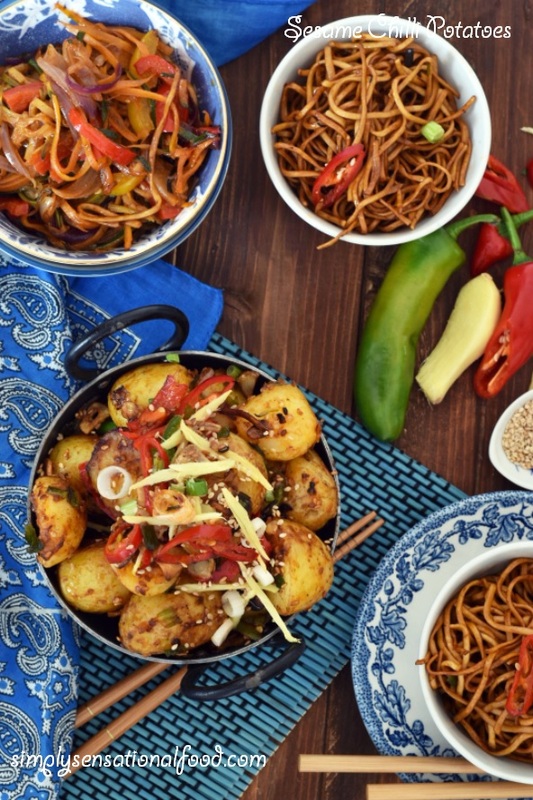 I like serving my Sesame Chilli Potatoes with Hakka noodles and julienne sauted vegetables to make a delectable and tasty Indo Chinese Meal. 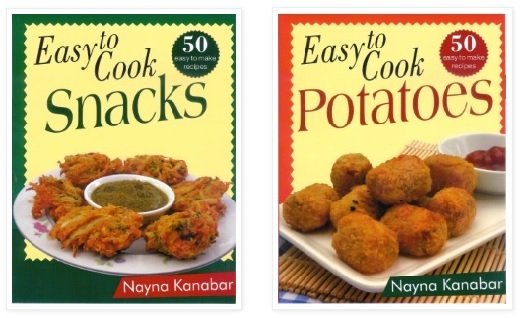 Do check out other British Gem Potato recipes below. Walnut Parsley and Gruyere Pesto Dressing on New Potatoes.